We’re a week closer to the trailer now and tons and tons of people have seen it! Don’t worry, we don’t mope too much. We even give you guys a strategy for ensuring the trailer is amazing! Our episode title comes from a Graff quote in the trailer, when he says that humanity needs “a new weapon” against the Formics. We finally got a new contestant for Pop Quiz, Fart Eater! We’ll play the results of that on next week’s podcast. 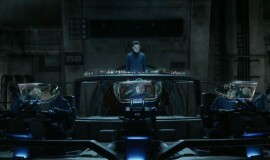 If you’re ready to test your Ender’s Game knowledge, just let us know!